Looking for quality fixed mounted fans for berth. Internet search lists MANY options with mixed reviews. DC 12 volt is what we need. Opinions please. We have 9 on Hobo. I like the quite part and the low amp draw. 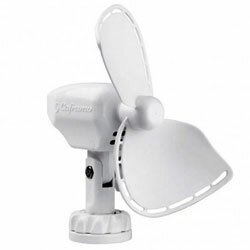 We've also had Caframo fans which are also good but not as quite. I have one fan, probably a Caframo installed by the PO in one corner, forward. It oscillates, has one speed and makes more noise than I would like. If I ever get around to it, I will install two two speed non-oscillating fans, one on each side. I will add remote switches so they can be switched on and off without getting out of the sleeping/watching TV position. The best fan for any vessel is the two speed Hella. 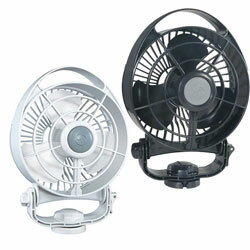 My side by side comparison of fans at a West Marine had the Marinco style fan as winner of the airflow contest. But experience on my and many commercial boats has shown they are noisier, draw a bit more and the collation mechanism seems to go long before the motor and gets really funky unless disconnected. I am sure there ae better fans out there, but they did seem to cost a bit more for less performance in my opinion...but I will have to wait and see about the longevity of my NE Caframos. Oscillating is OK...but on both my ac fans and space heaters...I find I usually don't use oscillation, so it wasn't something important to me....if it were, then the Hellas might have been the ticket. I went with the cheapest Hella single speed I could find. $22 on Defender if memory serves me. It is "too loud" until the temperature tops 80 degrees. Then suddenly it is just right. I also took another Hella and attached the base to one of those silver pins (clamps?) that the roofers use when tenting a house. I put that mid way down the side of my bunk to blow at my middle. That makes a Huge difference in the coolness. The portable clamp one has a cigarette lighter end so I can plug it in anywhere. It's right now next to me. It's easy enough to move it though I could I suppose wire a second one by my bunk. Definitely Hella. Mine are 8 years old and going strong. These were some of the first purchases for Seaweed. I put a pair in a friend's 24v boat. Wired together two 12 volts were far less $$ than the single 24 volt fan by Hella. As far as I know they are still working. Our sailboat came with 4 Hella Turbo fans from the factory. They all shook and rattled from new. Keeping the blades clean helped but as the boat had no air conditioning for years, we had to listen to these and I began to hate them! I finally got sick of them and one at a time I replaced them with various units from Caframo. 3 of the Maestro units and one Sirocco. These proved to be much more quiet and they didn't shake and vibrate. Life was much happier when we needed fans! I had the Hella fans on a previous boat and don't remember them being as noisy so perhaps we had fans from a bad production run? Not sure but on the next boat we will specify Caframo. I've found that different fan blades can make a difference. I keep several old ones around just for that reason. There's a cap on the back of the blade (the other side from the switch). Pop that off and with a small nut driver you can adjust the depth of the fan blade on the shaft. That and/or swapping out a fan blade that runs balanced has made a difference. I have also returned the fans for a new one if I had purchased it locally. They should run quite and balanced. This is not just a Hella fan problem. We've had Caframo's with the same issue. I have a Caframo 747 2-speed, open rubber blade fan in my salon. It's been a great fan with very low draw and quiet operation on low...a bit noisier on high, but never been a problem. I have the Caframo 748 3-speed, caged fan in my stateroom. I didn't want an open blade fan in my stateroom knowing I'd want to adjust it in the middle of the night and a finger strike was inevitable in the dark. Not that it hurts, just that it would tend to wake me. The 748 is a bit noisier than the 747 on low and much noisier on medium and high. The low setting seems to drown out the wave slap nicely on those warm, still summer nights at anchor. This fan is positioned so that it blows toward the head across from my stateroom to evacuate the shower humidity. It's quite effective. I should have mentioned that one of the Caframs did in fact get returned for a vibration... The beauty of purchasing from the store I chose was that 4 months later they simply handed me another one... After that they have been perfect! These are larger diameter so move more air with little juice, or noise. And can be used in any cabin. There is even an internal battery model for deck use. Sadly the 12V units come with a cigar lighter plug , but its easy to discard. We're experimenting with an O2Cool AC/DC fan, which runs on AC when present but also runs on its own internal rechargeable battery, or with standard non-rechargeable batteries. Two speeds, has a USB charging port for external devices... so far seems OK. No idea about longevity, yet. Have 2 Hella 2 speed "Turbo Fans" in the pilothouse. They came with the boat. The switch keeps popping off the front of one and the other vibrates. Not real impressed with the airflow. While I thought they were just junk when I bought the boat, I now realize that some fans loose there blade pitch over time and high hours. They may be 14 years old. They're on the list to remove or replace, low priority since I don't use them much. Ranger. We have used an O2 Cool fan, must be 6 yrs now, good little fan. With its ability to run off of 12v or 120v or internal batts, it is very versatile. Low current draw, and quiet. Ranger. We have used an O2 Cool fan, must be 6 yrs now, good little fan. So far, seems promising as a fan, and if longevity is OK, we're good to go. Just an idea Ted. Instead of the knob switch, simply turn it on and add an on/off switch in line. That won't fix the vibrate but it will solve the wonky knob issue. Good luck. We've been using Camfro fans for many years with good results. First we had two of the ones without the blade guards that we attached around the boat with the optional clips (they plug into the lighter outlets). Last winter we did a hard install of two fans in the pilot house overhead. They have all held up well and are fairly quiet. Amp draw is barely noticible. Carframo Sirocco, 3 speed with 4 timer settings, very quiet and very efficient. I had tried various fans until these and they are the ducks nuts. Very low power consumption. I have installed 6 on Tidahapah, one in the office and one over each bunk.